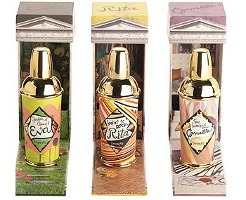 Benefit has launched a new trio of fragrances in the Crescent Row collection. Like their predecessors, last year's Laugh With Me Lee Lee, Something About Sofia and My Place or Yours Gina, the new fragrances, Garden of Good & Eva, Lookin’ to Rock Rita and So Hooked on Carmella, are based on fictional characters and packaged in boxes meant to represent their respective persona's homes. Garden of Good & Eva ~ a crisp citrus floral with notes of pear, watermelon, ozone accord, muguet, rose, jasmine, violet leaves, freesia, sandalwood, musk and cedar. Lookin' to Rock Rita ~ a fruity green fragrance with lemon, coconut, freesia, fig, hyacinth, violet, sandalwood, rosewood and vanilla. So Hooked on Carmella ~ A floral vanilla featuring lemon, grapefruit, rhubarb, cyclamen, peony, tiare, vanilla, sandalwood and amber. Benefit Garden of Good & Eva, Lookin’ to Rock Rita and So Hooked on Carmella are available in 30 ml Eau de Toilette. They can be found now at Sephora in France, and are expected to launch elsewhere this summer. I will try So Hooked on Carmella. I like a good floral vanilla. Does anyone know if these have any lasting power? Sorry, I haven’t tried them yet. I couldn’t believe how much I hated the first three, so I will be staying away from these as well. The Rita and Carmella don’t sound too bad, but i think that’s what I thought of the first batch. They were just very… icky. Did you really? I thought they were pretty innocuous. I wish I could remember what it was about them. I was going to buy a little set of them for a friend, since I thought the packaging was cute, but after sniffing them decided against it. There might have been one that wasn’t so bad, but at least two of them were really off-putting. Apparently it was just me that thinks so. Oh, I doubt you’re the only one! I thought they were fine for what they were: cheap, youth-oriented scents in fun packaging. Not the stuff of genius, admittedly. I remember kind of liking all three of the first set – but not enough to buy them. I got the samples free from Sephora and hope that they’ll do sets of these for their VIP customer program people. I agree that the first three were pretty boring and I have the same sort of feeling about these three. I wish the scents were as creative as the names. And no, the lasting power was abysmal. Eur 36 for 30 ml (Douglas Germany). I don’t think I’d ever keep the names straight. A bit too verbose in that department, but they sound tolerable. The first trhree were, I thought, pleasant enough but not FBW. I’ll try these when I see them, though they sound pretty much the same. I think the names are cute, and the price is certainly right. for the target demographic, I think these represent a viable option! I just got Looking to Rock Rita, yesterday, it is beaufiful, soft but deep, wears well, feels like it was bespoke just for me!!!! It was the first and only one I tried, but wow, it will be a repeat buy. I am very fussy about scents and this is one of the best I have tried in ages. Have been wishing for something like this. Great for hippy chicks!!! I am sorry…I did give them quick tries on paper after they came out, but I decided not to review them & have pretty much forgotten them. Sorry not to be more help!